Under that guideline, by 2020 all hospitals and clinics in China will give the elderly preferential treatment in medical care, and all nursing homes will be equipped to give them health and medical services. The Beijing Commission of Health and Family Planning will require all large public hospitals in the city to set up at least a department for rehabilitative medical services this year, and will choose six public hospitals to become specialized in rehabilitative care for the elderly, Fang Laiying, head of the commission, said on Thursday. Health authorities will also encourage private investment in care for the elderly and nursing services, and will conduct research into establishing a standard for mid- and long-term elderly care and hospice services in hospitals this year, Fang said. To cope with population aging and a consequent decline in the productive workforce, China adopted a law at the beginning of the year allowing all couples to have two children. "Population aging will be an irresistible trend in China in the next several decades," said Yuan Xin, a professor in population studies at Nankai University. 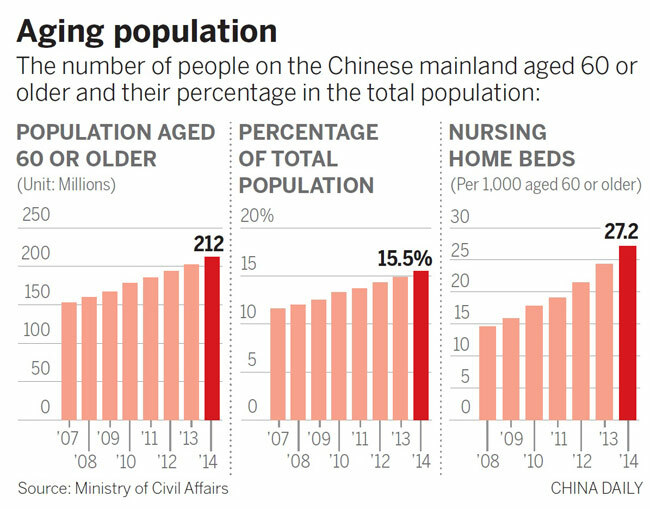 Already in 1999, more than 10 percent of the Chinese population was aged 60 or older－the benchmark percentage－and it has been growing ever since, he said. China's population aging is growing faster than in most other big countries, and the current social security system for elderly care and healthcare cannot cope with the trend, he said.